BobUI is a Default UI modification/replacement/enhancement (call it what you want it really is just a skinned default UI) addon written and intended to be efficient and bug free while still retaining the functionalities of a fully usable UI. To break it down that means BobUI is the default user interface that's been modified to look better while being extremely flexible (practically every part of this UI can be modified in some way). Backup your "Interface" folder. Then place all the files included in the download in your "Interface" folder. Some aspects may be out of place and requires moving but should work fairly well on any screen resolution. Non-wide screen resolutions will have to move stuff, I suggest either disabling panels/or just moving everything around to suit your needs. Keep in mind BobUI is built to be flexible and is easily one of the most flexible UI's out there. For the exact setup in the screenshots I use. Make a New chat frame call it "G,S,W"
to ensure rthreat is in correct position type "/rthreat reset"
BobUI is built to be stupid flexible, aka I put in as many config options as I find I can implement. Thus as Im always find new ways to allow you guys to tinker with the config I have no plans for in game configuration in my own core addons (the ones with Bob in the name generally) and all config is done via the config.lua files listed in each addon. However if there is a config question merely ask and I'll do my best to tell you how it can be done. Please post all bugs/issues/qq/death threats in the comments. BobUI Beta --Patch compatibility/stability not guaranteed. Feel like being awesome? Buy me a pepsi, only $1.50 where I live! Credits to Zork, Quilight, Tukz, Monolit, Blooblahguy, Kemayo, Horau, Nightcracker, tekkub, Tuller, Neal, Gello, Choonster. For accurate change logs refer to the beta page however this change logs are literally for the release I'm working on. I can't remember all the changes I've made but I know there's been a few with my resolution change, please double check your config.lua if you get any errors. fixed Aura back backround issue, report bugs as they come. A few functions have been removed I can't remember most of them that were. fixed rFilter3 skin, yes it took me 3 months to realize I never put a border on it. scrapped bag2.lua never got it working like I wanted so I deciuded to focus my efforts on the other bag file especially since I might have to redo it come next expansion anyways. bag.lua has been rewritten now supports bags and bank! Optimized chat fixed a few errors as well. Corrected a buf with Group Tabs on raid/party frames showing. Removed CD announcement I never had working anyway. Test bags are being transferred from the test.lua to create a new option called bags2 (cfg.bags2 in config file). Corrected some positioning issues with Stance Bar and ExtraActionButton (stance is on right side of bottom actionbar ExtraActionButton is placed on the upper right of top actionbar). Due to issues with special power bars I am forced to move the Pet Frame to a lower location. Not as pretty but it won't mess up shadow priest/warlocks now. Corrected nonInterruptable Cast bar shield glitch, should be hiding properly now. Removed Bobmedia it will be included as a seperate file found here. There is a known issue with 3d portraits, this is a blizzard bug. Added config options to remove portraits. castbars are positioned appropriate to unitframes to get them out of the way. Unitframes should look a little better still a W.I.P. (pet frame is extra annoying). Worked on some textures for Unitframes, their crappy;y made and need a cleanup job, but they work. The skinning.lua file in BobUI has now been moved to be it's own seperate addon !UIskinner also skinned a few more things with it. Added a lot of new and shiney config options at the top of most .lua files in modules a seperate config file is being planned. "Textures" folder renamed to "Bobmedia" and is unused, but it does contain the textures I'm using. swapped Postal for OpenAll(fan update) I only really used the Openall option for postal anyway. tuk ui updated, added Basicbuffs, Basicchatmods, Genie, Power Auras, Tidyplates (removed uneeded themes and only kept neon and hub), tuk ui dbm skin, and I readded omen. tukui added, removed half a million addons. Memory should run significantly lower now. Dominos Bar4 is now on a fader and will showup if you mouseover it (poor attempt to make the UI look a bit less buttony) Menubar moved to above the minimap and chatbox is now on the bottom of the screen. Ok fine. I may or may not post an update, I'm getting the drive to work on this again. As a monk i cant get the addon/pack to show my Chi's do you know of a way to get these to be present? Rogue is the same problem but for CP's. Thanks in advance for an awesome ui. Sorry for the late response, I haven't done much of any work on BobUI in the last 7 months due to me not even playing the game. As I have no interest in playing the game I have n o real interest in working on any of my addons. However anyone may wish to update any of my addons, all the licenses allow for doing so (although BobUI is the most restrictive). Alternatively one can just email me a fix to [email protected] and I will update it here following the update process I was using (posting to beta page first then here). my chat is being reset every time I do a /reload or enter a loading screen , as well as when I level up etc. how can i make it stay? 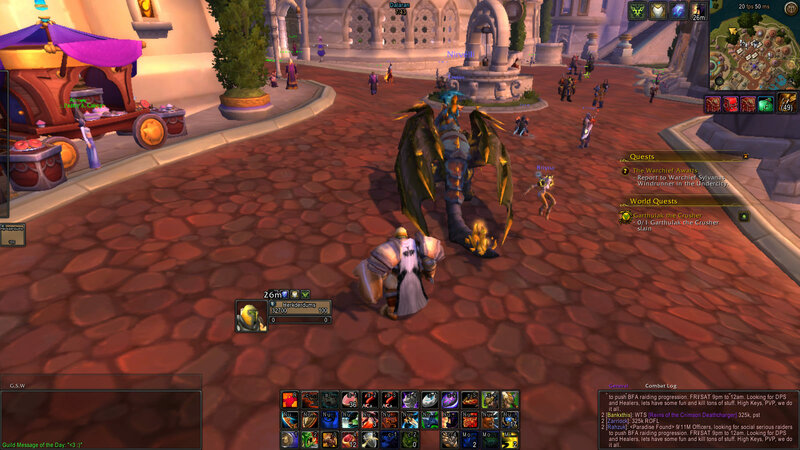 Disable BobUI-Setup that addon auto sets chat frames and channels to the positions I show in the screenshots I made. Da ich leider kein Englisch soweit kann, mal eine Frage auf Deutsch. >> This is a question in german because i don't speak english. Finde das oUF_Bob voll supi. Nun meine Frage, Kann man das irgendwie verstellen? oder bzw verschieben? >> I like the oUF_Bob. My Question: Can you change or move it? Leider habe ich nicht Deutsch sprechen, so muss ich verwenden Google Translate. >> Sorry, i don't speak german so i have to youse google translator. Alles, was ich von ihm bekam, war etwas über oUF_Bob wenn auch nicht sicher, was Sie wollten. >> All i get from you was something about oUF_Bob, not for sure what you want. >>If it is about a functionality you should download.... the beta-mainsite. This ist the way i understand it - hope it helps. Can someone help translate what he said for me? I don't speak german and google translate isn't translating clear. Last edited by 10leej : 03-14-15 at 12:50 AM. Last edited by 10leej : 03-05-15 at 01:04 PM. BobUI is about to become awesomer? I've always wanted to put as many config options as possible in anything I do. Nowadays I look at the config file for BobUI alone and it's a little long imo. So As well as the usual rewrite with each new main version (In this case 7.0) I'm breaking up into multiple config files as well as giving a user many more options. And yes they'll have their own folder (called config) and will be named similar to how the config options are lebelled now. Also BobUI license will be changing in v7.0 there will be more information provided once 7.0 enters it's beta state. Until then you (the user of BobUI) should assume I'm still using the All Rights Reserved license that is currently provided in the Misc folder of BobUI. As per regulation the beta for 7.0 will be posted on the BobUI beta page. Last edited by 10leej : 01-09-15 at 11:58 PM. BobUI now has a beta page. I've determined this would be the best course of action since I don't actively play anymore. Keep in mind I can't do much testing myself so this page fopr you all to kindly test for me. Bored out of my mind looking for testers with WoD beta access for BobUI to tell me how horribly broken it is. If your going to test please only report issues with my addons (BobUI and oUF_Bob) other addons will have to be updated by their respective authors. Last edited by 10leej : 10-04-14 at 01:14 PM. Re: The end of BobUI? So I reclaimed my preorder for Warlords of Dreanor, not sure if I'm ever going to purchase it again. However there is a chance. I am looking for people to join in and help keep BobUI alive! I hate the idea of leaving somethign I spent so much time on behind. It's just that WoW lately just has not appealed to me past updating BobUI and all of my other addons. They all work currently I haven't seen any taint or lua errors myself, then again I haven't officially logged into the game in almost..... 4 months now I think. This UI is developed by someone who lives under the U.S. poverty line, please be kind and buy me a pepsi!